After a 1971 JSCAA Championship at Flo Valley and reaching Regionals in 1972, Paul was awarded All American honors and All Tournament Team in 72. His next move was to Quincy landing him a Tri-Captain position along with two NAIA National Championships in 73 and 74. 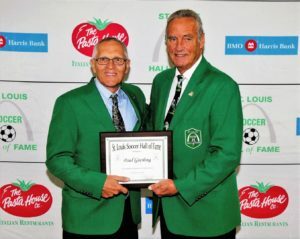 Returning to St. Louis, Paul became an integral part of the Pepsi S.C. that won a Missouri Open Cup in 1974 and a 1975 Missouri Amateur Cup and was selected as a CYC All-Star in 1974.